Let's begin this review by addressing the elephant in the room. In March, 2016, Warner released it's tentpole DC Comics movie Batman v Superman: Dawn of Justice to mixed reviews from both critics and audiences. Despite this the film went on to gross $330 million at the U.S. box office. (That may seem like a lot, but Marvel's first two 2016 releases Deadpool and Captain America: Civil War made $363 million and $408 million respectively.) However, that was definitely a disappointment for a movie featuring two of DC's most popular character. A little over four months later, Warner released another DC film, this one containing a stable of little-known comic book characters, and it went one to bring in just $5 million less than Batman v Superman. While they aren't turning down the money, this has to be somewhat embarrassing for Warner. How did Suicide Squad pull this off? Suicide Squad takes place after the events of Batman v Superman. Amanda Waller (Viola Davis) approaches the government with an idea -- use imprisoned metahumans (re: super villains) for covert missions of national security. The officials balk at this at first, but when Waller uses the power of Enchantress (Cara Delevingne), an ancient witch, as a demonstration, they are interested. When an evil force attacks Midway City, Waller is given the go-ahead to put together Task Force X. 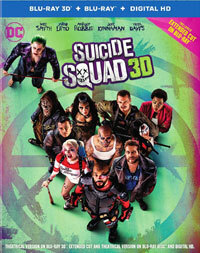 She and her military muscle, Rick Flag (Joel Kinnaman), visit a remote prison to recruit their team members; Deadshot (Will Smith), a highly skilled marksman; Harley Quinn (Margot Robbie), a psychotic cupie doll who was driven insane by The Joker (Jared Leto); Killer Croc (Adewale Akinnuoye-Agbaje), a reptilian monster; Diablo (Jay Hernandez), a gang-banger who can produce fire; and Captain Boomerang (Jai Courtney), a guy who throws boomerangs. Once they are joined by Flag's counterpart, Katana (Karen Fukuhara), an assassin, they infiltrate the city and begin to fight a supernatural foe. However, the group of super villains feel that they are being sent on a mission from which there is no return. Suicide Squad has a lot of things going for it. After years of superhero movies, the movie flips the script and places supervillains in the foreground. This group of bad guys is diverse and we certainly get a mixed rogues gallery here. Several of these characters will be unknown by the general public (and maybe even comic book fans), but by peppering in The Joker and Harley Quinn (and a cameo by Batman (Ben Affleck)), the movie gives something for the non-fanboys to grasp onto. Perhaps even more impressive is the cast. Did you notice that there are five Oscar nominees in the film? Will Smith passed up Independence Day: Resurgence to do this film, which definitely says something about one of the movies. Any movie which can offer eye-candy like Margot Robbie and a super-serious actor like Viola Davis must have something going for it. Director David Ayer has a reputation for making gritty urban action films. However, all of those things can't supersede the actual movie itself. Reportedly Ayer was only given six weeks to write the script, as a release date was already set in stone. I won’t go as far as saying that this is obvious, but the story certainly shares some traits with some other movies. The squad’s infiltration of Midway City is very, very similar to Escape from New York, even down to the device used to keep the villains in-line. The finale bears a striking resemblance to the ending of Ghostbusters. There are also some issues with the editing, and the movie feels very episodic. Most of the first act feels like a trailer, as each of the villains is introduced and given a brief bio. The middle of the movie is very jumbled and the revelation of the villain comes out of nowhere. We also get some new characters who suddenly show up during this period. And then we have The Joker. Much was made of Oscar-winner Leto being cast in this iconic role, and one would assume that he would put his own spin on it. Well, he certainly did that. Of course, a lot of it has to do with The Joker’s look. Who decided to bring pimp-Joker into this movie? And with his slicked back hair and pale face, he looks exactly like Macaulay Culkin from the bathroom scene in Home Alone. As for his performance, Leto decides to move away from the manic energy which others have brought to the role and instead brings us a Joker who moves and speaks slowly. Even his version of the Joker laugh is slow. Rumor has it that other scenes with The Joker were cut...and I’m OK with that. To be honest, I thought that Suicide Squad would be a complete trainwreck. There are some kernels of something good here, but for everything the movie does right, it does two things wrong. Some of the character designs are good, there are some interesting moments in the action scenes, and Ike Barinholtz is funny, but the movie can’t overcome things like the villain’s henchmen looking like raspberries. Maybe if they’d been given more time, then Suicide Squad could have been a complete movie, but as it is, it doesn’t feel finished. But, it’s still better than Batman v Superman. The film has also been released as a Blu-ray 3D, where the film is letterboxed at 2.35:1 and the Disc contains a MVC 1080p HD transfer which runs at an average of 26/12 Mbps. This is a very disappointing 3D release. The depth is non-existent in many shots -- I kept taking my glasses off to make sure that they were working. A very shots show some layering, but the bulk of the movie looks just like the 2D release. Once the movie turns to complete nighttime, things get even worse. The colors are still good in this release, but I was surprised by the lack of 3D effects here. This Disc offers a Dolby Digital 5.1 audio track which runs at 48 kHz and a constant 384 kbps. The track provides clear dialogue and sound effects. We get some nice stereo, surround, and subwoofer effects here, but they aren't as crisp and powerful as the lossless track. 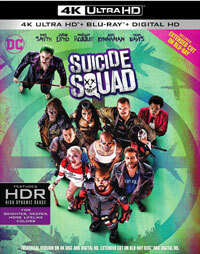 Warner has also brought Suicide Squad to 4K Ultra HD. The film has been letterboxed at 2.35:1 and the Disc contains a 2160p HD transfer. The image is very sharp and clear, showing no grain and no defects from the source materials. The nighttime scenes are notably sharp and are never soft. The colors look very good and true. The crispness is noticeable in the daytime scenes. This doesn't look quite as good as some other 4Ks I've seen, but it is a slight improvement over the Blu-ray Disc. The Disc carries a Dolby Atmos (7.1) audio track which provides clear dialogue and sound effects. It's very similar to the track found on the Blu-ray Disc. The Suicide Squad Blu-ray Disc contains several extra features. "Task Force X: One Team, One Mission" (23 minutes) examines the history of "Suicide Squad" in the DC comic books. Featuring interviews with writers and artists from the world of comic books, the piece offers several images from the comics. From there, it examines how the characters are portrayed in the film, which offers comments from the cast. "Chasing the Real" (10 minutes) focus on Ayer's vision for the movie and how he attempting to create a look and feel for the film which came across as realistic. "Joker & Harley: 'It' Couple of the Underworld" (14 minutes) takes a closer look at the two characters, profiling each and delivering comments from the actors. We get to hear about how Jared Leto actually "became" the Joker on-set. We see how the actors trained for the fight sequences in "Squad Strength and Skills" (9 minutes). "Armed to the Teeth" (12 minutes) introduces us to the props and weapons which helped to define the characters. "The is Gonna Get Loud: The Epic Battles of Suicide Squad" (11 minutes) gives us a look at the big fight scenes in the film and the way in which real-life actors and props were used. "The Squad Declassified" (4 minutes) is an odd piece which looks at the first big fight scene. The final extra is a 2-minute GAG REEL.